NOLA beaches, on the Louisiana's Gulf Coast, are best known for their fantastic powder-fine white sand and attract thousands of tourists every year. Some coastal towns are offering more entertainment, such as the casinos of Biloxi, while others are perfect for long strolls and quiet relaxation, such as Panama City Beach or the beaches on Ship Island. The beaches are also home to turtles that come to nest annually as well as many seashore birds. 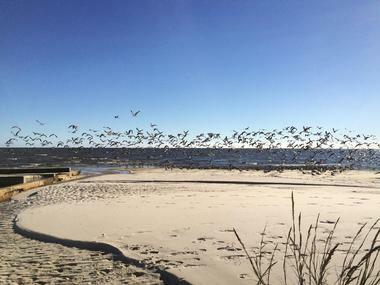 The annual bird migration is a popular event that brings tourists and bird watchers to Dauphin Island every year. Known as the “Riviera of the South,” the Biloxi/Gulfport area has a lot to offer visitors, who mostly come to one of many casinos. 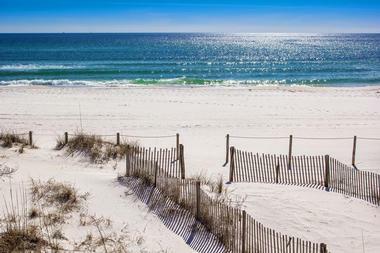 However, the fantastic white sandy public beach is reason enough to visit these two Mississippi cities that are connected by Highway 90. 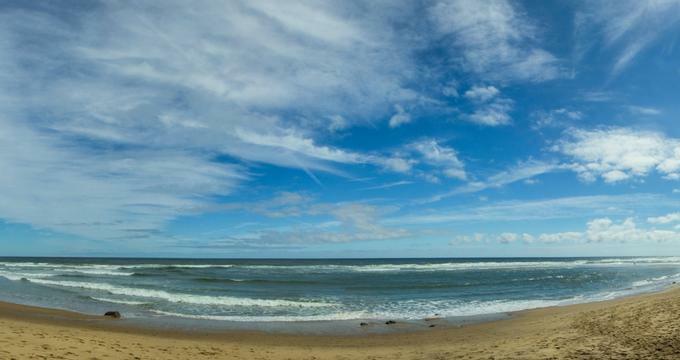 Perfect for a long stroll, the beach is well maintained and has chairs and umbrellas to rent as well as jet skis and kayaks. The Biloxi beachfront stretches along the Mississippi Sound and a number of barrier islands are located just off the coast in the Gulf of Mexico. Besides the public beach, large expanses of beaches in the area are part of the Gulf Islands National Seashore, a protected area that also includes wildlife sanctuaries, small islands you can reach only by boat, scenic bayous, picnic areas, nature trails, and campgrounds. Bogue Chitto State Park is a 1,786-acre area near Franklinton, Louisiana, with a number of diverse natural habitats that include small streams, a hardwood forest, cypress tupelo swamps, rolling fields, and upland forests. One of the most interesting features in the park is Fricke's Cave, actually a gorge filled with delicate spires made of sandstone. They were formed by water erosion of the rock surface under the pebbles. When the sandstone rock is dissolved, the pebbles show up on top as the spires. Over time, these have grown to over 2 feet high. There are boardwalks for visitors so that they can come and enjoy the view without damaging this fragile work of nature. The park has 14 miles of horseback riding trails, and the river is perfect for kayaking or canoeing while the 11 lakes are fully stocked with fish. There are campgrounds and cabins for overnight stays. Dauphin Island is a small southern town on a same-named barrier island on the Gulf with a long history of marine culture, miles of pristine uncrowded beaches, great fishing, and a long, turbulent past. 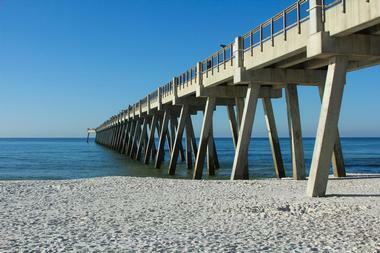 The island is located at the southernmost end of Alabama, about 3 miles from Mobile Bay. Easy to reach, it feels miles away from the modern world. Most visitors arrive across a 3-mile-long scenic high-rise bridge or by a regular ferry. 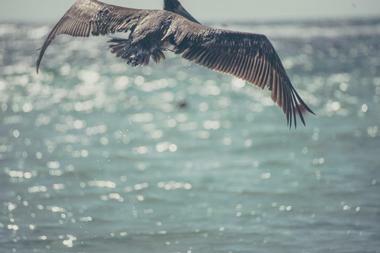 The entire island is a designated bird sanctuary, and the annual bird migrations attract thousands of visitors. The east end of the island has most of the attractions, such as historic Fort Gaines, the Audubon Bird Sanctuary, and the Dauphin Island Sea Lab. The best beach on the island is on the west side, a perfect stretch of fine white sand surrounded by parks, ancient oaks, and a golf course. Grand Isle, known as a “Sportsman’s Paradise,” is a remote oasis on Louisiana’s rich shoreline, known for its high-class fishing and large birding habitat. Grand Isle is the only inhabited barrier island in Louisiana, with unobstructed views of the Gulf of Mexico, 7 miles of sandy beaches, and diverse, rich wildlife. The Butterfly Dome is home to native plants and butterflies. 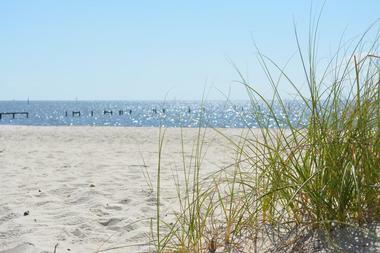 Just across the Grand Isle is Elmer’s Island, a home to Elmer’s Island Wildlife Refuge, a 230-acre barrier beachfront. At the east side of the island is Grand Isle State Park, with the best beaches on the island, a 400-foot-long fishing pier, several nature trails, and an overnight campground. Located on the shores of the Gulf of Mexico in southwest Louisiana, Holly Beach is a charming beach-front community known as the "Cajun Riviera." You can spend a day relaxing and enjoying the sound of crashing waves in the Gulf of Mexico, stroll along the long sandy beach collecting shells, swim in warm, shallow waters, fish, crab, or sit in one of many beach bars watching beautiful people pass by. Try the local fish or some of the great Cajun specialties and wash it down with a cool, refreshing drink. The town has been damaged by two hurricanes and many quaint accommodations that tourists loved have been destroyed, but the town is working hard to recuperate and offer that famous Cajun hospitality. Panama City Beach is a lively waterfront town in northwest Florida known for 27 miles of white sand beaches stretched along the calm, warm waters of the Gulf of Mexico. 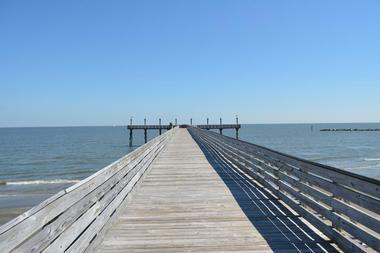 Nearby St. Andrews State Park is one of two neighboring protected nature preserves along the Gulf, with great hiking trails and several fishing piers. The waterfront is famous for its seafood restaurants serving local daily catch. Offshore, just off the beach, are dozens of artificial reefs popular with divers as they attract thousands of colorful sea creatures. The beach is also a popular spot for watching spectacular sunsets over the Gulf horizon. 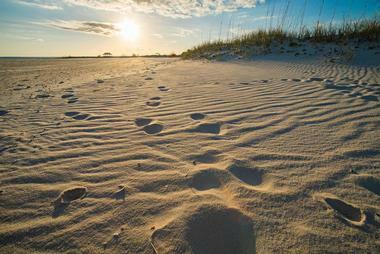 Ship Island is a popular tourist destination about 12 miles off the Biloxi coast. The main attraction is a sparkling white sandy beach located on the south side of the island. Exploring historic Fort Massachusetts is also fun. Take advantage of the free and very knowledgeable tour guides. The fort was constructed to protect the coast after the War of 1812. 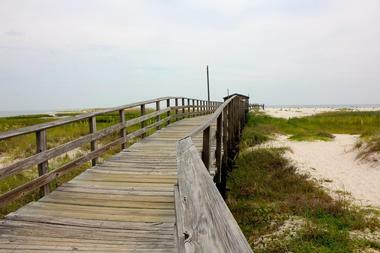 The Ship Island boardwalk runs along the beach and there you can find some beach supplies you may have forgotten to bring. A ferry connects the island with the mainland docks and leaves from the north side of the island. The ferry ride takes about 1 hour and if you are lucky you might spot dolphins during the ride.